After great success in the United States, Mafalda Minnozzi’s “Tour of the Americas – 2019” crosses the equator to arrive in Brazil in March. With her new show “Portraits in Bossa & Jazz”, the singer confirms her never ending desire to surprise the audience and to conquer it by creating a gallery of attractive musical paintings drawn with the light strokes of bossa nova, the liberty of jazz and colored with the many shades of her voice. 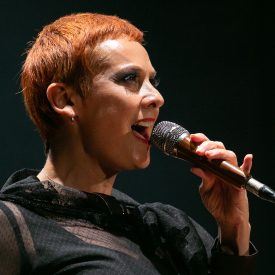 The show highlights Minnozzi’s place in the current international musical scene as a singer of the highest quality, both traditional and innovative and a leading voice of these modern times. 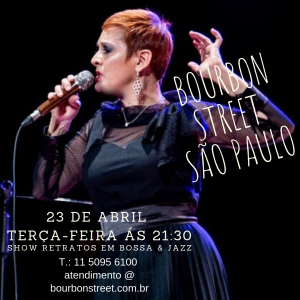 On March 23 (Thursday), the singer performs at the BOURBON STREET MUSIC CLUB in SAO PAULO / Brazil, before traveling to other capitals of South of America. During the presentation, Mafalda promises to fascinate the audience with songs that take the form of tenuous watercolors, vibrant frescoes or irreverent graffiti. “Triste”, by Tom Jobim, suggests a sincere postcard in the simplicity of its delicate colors, while “Metti Una Sera A Cena” by maestro Ennio Morricone is “painted” as a landscape of strong harmonic density. The “chiaroscuro” and the shadows of dawn are revealed in Chico Buarque’s “Morro Dois Irmãos”, while “Sacumdí Sacumdá (Nem Vem Que Nao Tem)” is a true explosion of brilliant paints against the sunset tones chosen for “Estate” by Bruno Martino. Fine lines drawn with pencils of greens and yellows make up the drawing of “Un Altro Addio (Mais Um Adeus)” by Toquinho and Vinicius de Moraes. “Portraits in Bossa & Jazz” certainly represents the singer’s desire to break down any preconceptions about genres and musical styles to eliminate barriers, overcome conventions and refuse labels. Her songs are much like pictures that impress and thrill wide audiences without the need for explanation, just as it happens when one looks at a canvas at an exhibition. The show has a thousand nuances: planting its roots in jazz and combining the subtlety of bossa nova, it goes straight to the soul regardless of language. Diverse sounds and atmospheres are unified by the architectural arrangements that allow the spontaneity of improvisation over the rhythmic and harmonic settings, revealing all the facets of Mafalda and the impeccable technique of the New York guitarist Paul Ricci.